We understand the impact good design can have on offices, not only visually representing your business but also improving staff wellbeing, efficiency, productivity and ultimately profit. With Forster Inc., you get the best of both worlds: a small, dedicated design team with a large portfolio. We have worked with a variety of companies, ranging from start-up to multi-national, from accountancy firms to think-tanks. Our ethos means no hidden costs and a completely independent design, so you can be sure that what you receive is what’s best for you – not for us. Global innovation and design firm IDEO asked Forster Inc to make their London office flexible, collaborative and with the feel of a café. We created designated areas for work and relaxing, using soft furnishings in the social areas to bring a feel of domesticity. Tall shelves help enclose this meeting space and separate it from the more work-driven project rooms. The end result is a bright, comfortable space that encourages creativity and collaboration. IDEO wanted a reception area and communal space that would make them proud to show to their clients. We centred the design around a coffee meeting point, encouraging collaboration and making lunch breaks much more accessible. The combination of quality design pieces – such as Vitsoe shelving – mixed with raw, reclaimed materials creates a story that compliments IDEO’s brand and way of working. 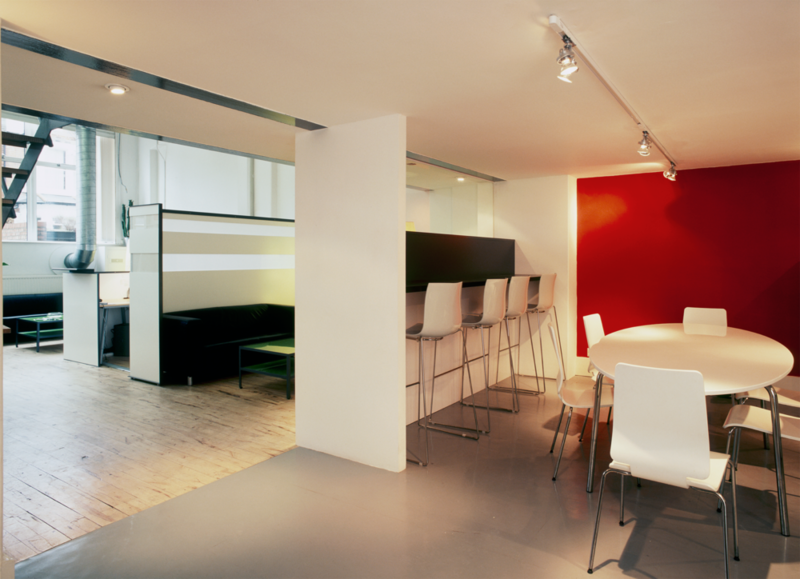 This breakout area required flexibility as both a place to eat and a place to meet. 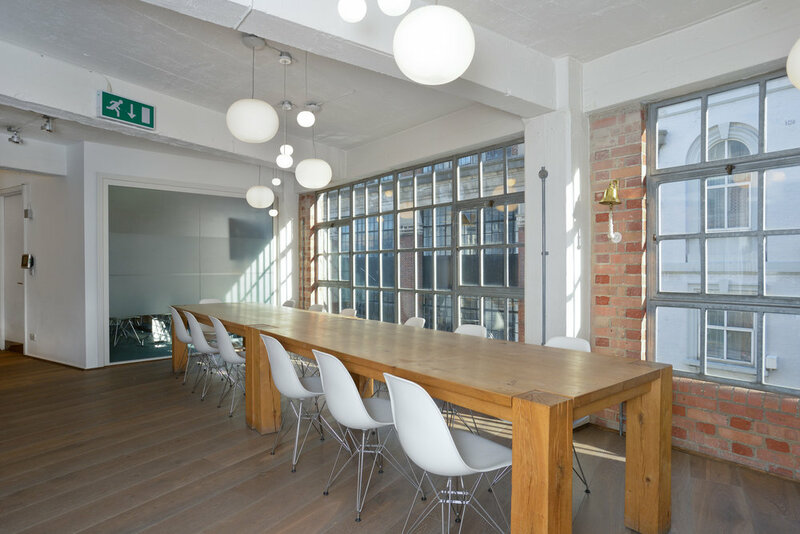 Long oak tables encourage collaboration, community and provide an accessible space for employees to gather. High design elements, such as Jasper Morrison Glo lights, are juxtaposed with the exposed brick and raw wood befitting of a warehouse space. Many of IDEO’s employees cycle in to work, and thus we needed to incorporate an easily accessible bike storage solution into the design. We installed this yellow two-tier bike rack that is eye-catching, tidy and practical. Serving as an office, a relaxation space and a prep room, the main challenge in this part of the project was establishing privacy while also maintaining flexibility. We built customised bookshelves, installed a new bathroom and built a seamless storage system, all of which help transform the space. A private area that can be closed off was formed using full-height oak and translucent panel doors, providing an area for quiet. The client wanted his private area to be calm and easily separated from the rest of the space. We installed oak framed sliding doors with hexagonal polycarbonate opaque sheets that bring in light while keeping privacy. Customised fitted shelves sit on a polished concrete floor, complimenting the exposed-brick wall. A blue sofa from SCP serves as a tranquil yet bold feature. To update this dark meeting area, we replaced a wall around the stairs with an open handrail, which allows more light to come through. We painted the main wall with white magnetic paint and installed viewing lights to create a gallery-style feature wall. Daylight blinds on the windows help control the light, and bespoke shelving underneath accommodates their magazine archive. 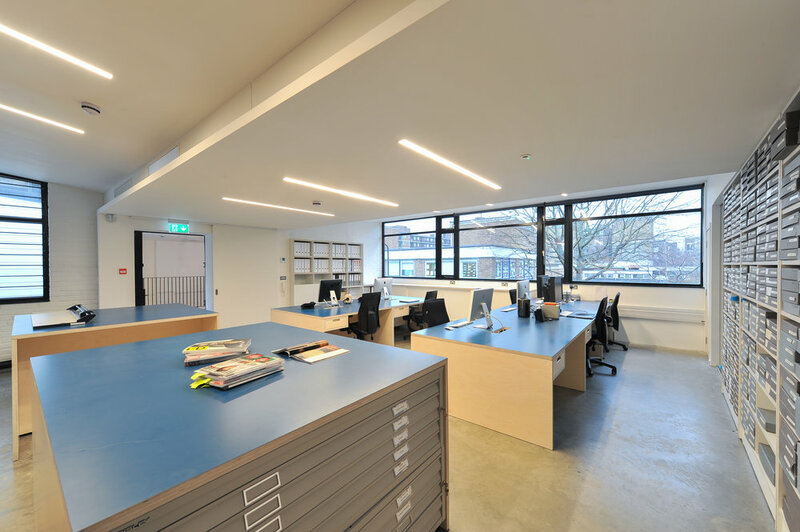 The main priority for this office and archive was to build easily accessible and bespoke storage. We designed and built a double-layered rolling unit to accommodate their hefty photograph archive, all of which can be rolled out and used as needed. We also built bespoke boxed shelving that fits perfectly in the archive storage. Further archive storage was designed in a series of islands. The plan chest islands are skinned with ply and Formica to match the bespoke desks. When employees asked to have personal drawers at each desk, we listened and customised this to each seat. Flow Interactive offer a range of consultancy services to help research, design and evaluate interactive products. They asked Forster Inc to design and space plan an office that bolsters this service and reflects the Flow Interactive brand. We focused on updating the front of the office, which included the reception, meeting and kitchen areas, creating a space the company is proud to show to clients. Rather than building separate rooms, we used screens to designate different areas in this open-plan office, helping to establish a more efficient flow to the space. We also separated meeting and break spaces by using different furniture for each area. We created a library space by designing and building bespoke shelves and cabinetry. Pops of colour were incorporated throughout the design as a way to bring colour into the dark space, which lacks natural lights and windows. Want Forster Inc to improve your office space?